La'Soul Magic Makeover QQ Cream is a good concealer, broad spectrum sunscreen, anti-aging effect, even skin color tone, minimize pores, easy to makeup and have a good moisturizing effect. SKU: SNE14 Categories: Promotion, Beauty, Facial, Sunscreen and BB cream and CC cream Brands: Lasoul. 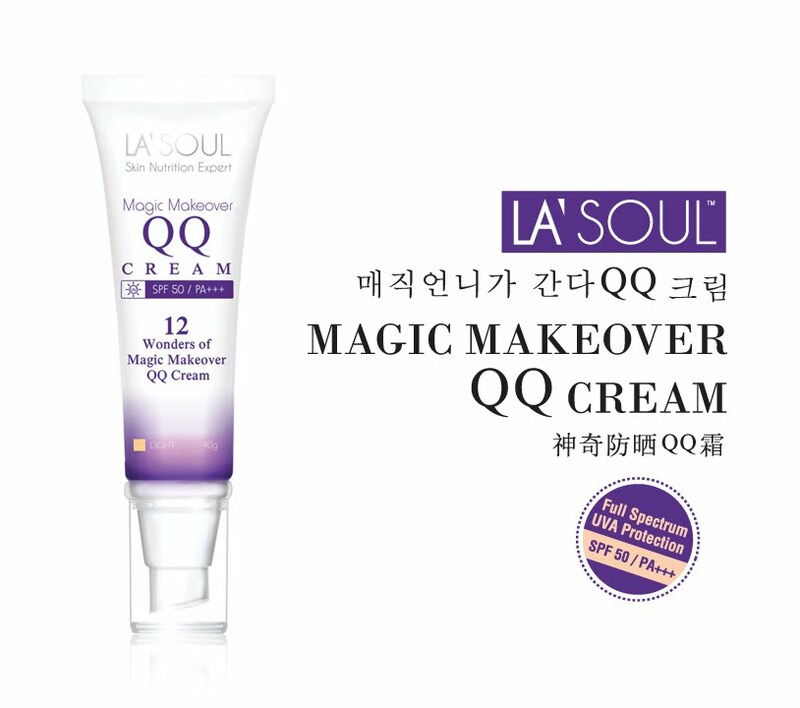 ‘ asoul Magic makeover QQ cream is unique and most popular product in South Korea, variety of natural ingredients are extracted to develop this magic makeover QQ cream. 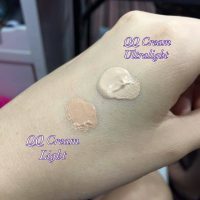 It is a good concealer, broad spectrum sunscreen, anti-aging effect, even skin color tone, minimize pores, easy to makeup and have a good moisturizing effect. 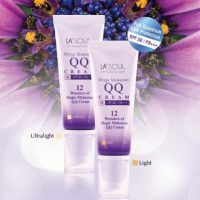 La’Soul Magic makeover QQ cream is most suitable for those whom do not like make-up. After used, skin will look more natural, skin tone evenly, shinny, effectively hide blemishes, fine lines and pores, yet will not hinder skin respiration and not clod pores. Chamomile flower extract, rosemary extract, arbutin, adenos-ine and hyaluronic acid able to help kin repai and prevents the formation of block spot and pigmentation. Magic makeover QQ cream is developed from pure plant extracts, and is highly effective in sun protection with SPF50 and PA+++, without any chemical ingredients. Even continuously sweating under hot weather, skin color remains fresh and even. Right skin care can help to maintain the health and vitality of skin condition persistency and lower risk of skin cancer. 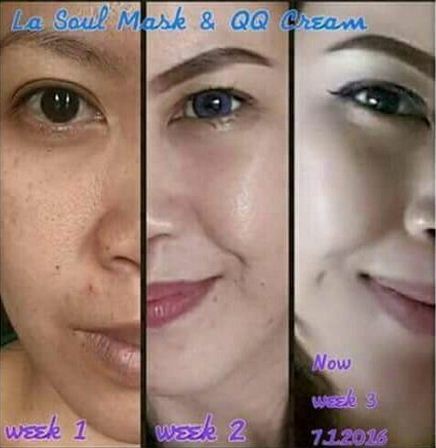 These are two of the most significant benefits by magic makeover QQ cream. Magic makeover QQ cream with whitening and anti-aging function, is specialized in research and development of additional upgrades for Asian women skin nature of Korean products. 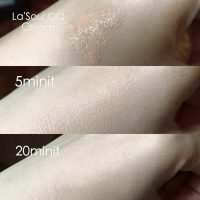 Everyone is suitable to use Magic makeover QQ cream every day, from the perspective of protecting this skin, it acts as a layer of protective effect, form a natural skin surface to protect our skin, while isolated from computer radiation, dirty air, makeup, pollutants and etc. It makes your skin more delicate, even tone, just as beautiful even without make-up! 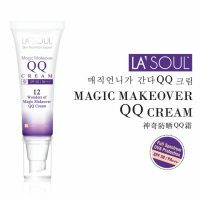 La’Soul Magic Makeover QQ cream containing sunscreen SPF50 and PA+++ is enough for daily use. For outdoor activities, it is recommended that to apply magic makeover QQ cream 30 minutes before going out and need not to apply other special sunscreen. 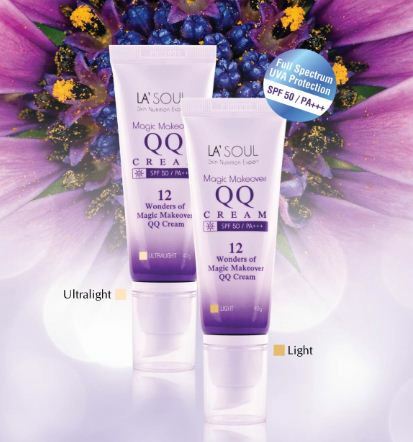 Magic makeover QQ cream can effectively resist ultraviolet rays and protect your skin. Apply toner & moisturizer, Proper apply an appropriate amount evenly over face and neck. Apply it evenly as a foundation that covers blemishes & evens out skin tone.